Windows have been a significant part of OPTICAL SURFACES product range from the beginning, satisfying customer requirements for the last 50 years. Windows have been produced for aerial surveillance and reconnaissance in a variety of materials including Zinc Sulphide and Germanium. 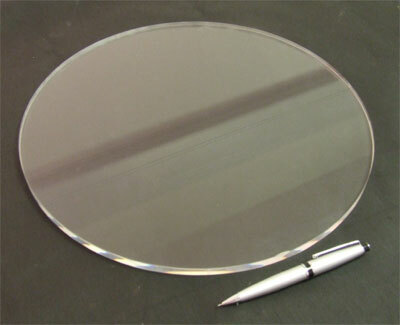 A specialty has been the production of very high quality debris shields, with a high diameter to thickness ratio; these are commonly used in massively powerful laser research establishments to protect other components while maintaining optical performance in the beam line. An essential part of the laser guide star beam expander supplied to the Keck, V.L.T. and the SUBARU 8.2m telescopes was a 536mm window used to enclose the instrument on top of the main telescope’s structure. The window had a thickness to diameter ratio of 21:1 and had to achieve a wavefront accuracy of better than 20nm rms. The optic was tested over the full diameter using Optical Surfaces 600mm diameter window tester, which ensured that the specification over the entire surface was met. When the laser guide star system was implemented an enhanced viewing of a factor of ten of the telescopes’ performance was reported.